Set in Zadar, this air-conditioned holiday home is located 800 metres from The Museum of Ancient Glass. Guests benefit from balcony. There is a seating area and a kitchen equipped with a dishwasher. A TV is offered. There is a private bathroom with a shower. Five Wells Square is 900 metres from Holiday Home Zadar 14133, while The Captain's Tower is 900 metres from the property. The nearest airport is Zadar Airport, 9 km from Holiday Home Zadar 14133. 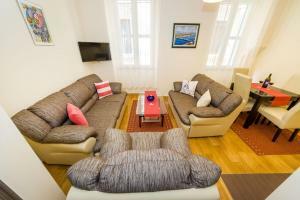 When would you like to stay at Holiday Home Zadar 14133 ? This holiday home features a balcony, dishwasher and oven. Each day we'll check prices and send you an email for your selected dates at Holiday Home Zadar 14133. If you don't have specific dates but would like to check prices for say next weekend or say next month we can check the price too. Click to write a review and share your experience of Holiday Home Zadar 14133 with other travellers.